Flores & Prats Architects + Duch-Pizá. 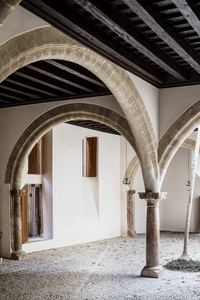 Casal Balaguer Cultural Center in Palma de Mallorca, Spain. 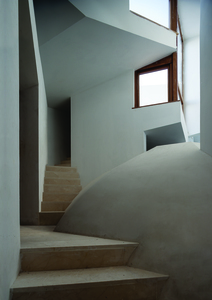 Upper terrace surrounded by lightwells. Photo: Adrià Goula. 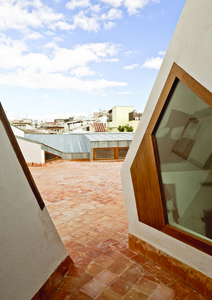 Flores & Prats Architects + Duch-Pizá. 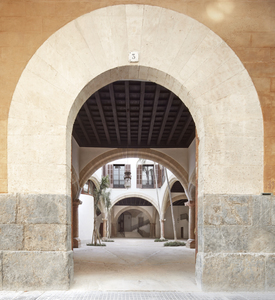 Casal Balaguer Cultural Center in Palma de Mallorca, Spain. Lightwells and lecture room towards the terrace. Photo: Adrià Goula. 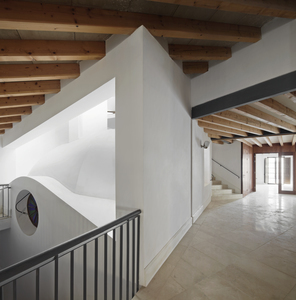 Flores & Prats Architects + Duch-Pizá. 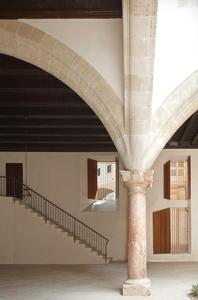 Casal Balaguer Cultural Center in Palma de Mallorca, Spain. 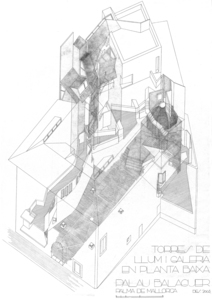 Terrace access among volumes of lightwells. Photo: Adrià Goula. Flores & Prats Architects + Duch-Pizá. 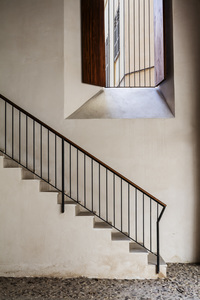 Casal Balaguer Cultural Center in Palma de Mallorca, Spain. Terrace to the South. 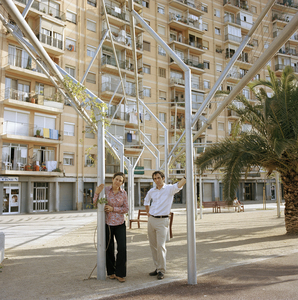 Photo: Adrià Goula. Flores & Prats Architects + Duch-Pizá. 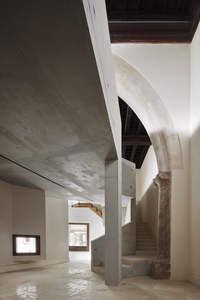 Casal Balaguer Cultural Center in Palma de Mallorca, Spain. 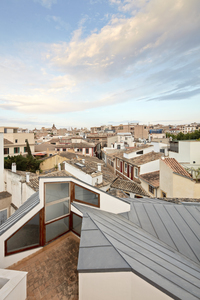 Roofscape and old town. Photo: Adrià Goula. Flores & Prats Architects + Duch-Pizá. Casal Balaguer Cultural Center in Palma de Mallorca, Spain. 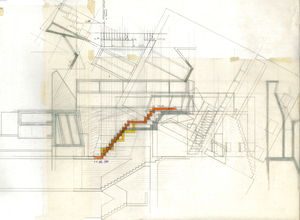 Transverse section through old and new staircases with lightwells above. Flores & Prats Architects + Duch-Pizá. 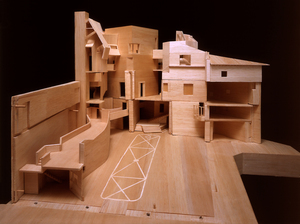 Casal Balaguer Cultural Center in Palma de Mallorca, Spain. 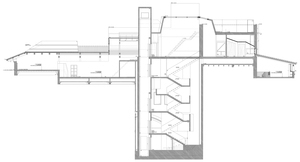 Longitudinal section through exhibition gallery, new concrete stairs and bar-restaurant. 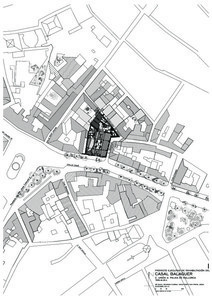 Flores & Prats Architects + Duch-Pizá. 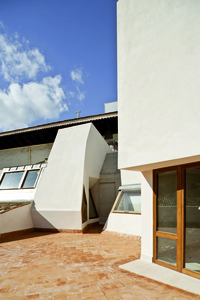 Casal Balaguer Cultural Center in Palma de Mallorca, Spain. General view. 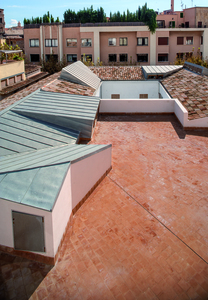 New and old roofs. Photo: Adrià Goula. Flores & Prats Architects + Duch-Pizá. Casal Balaguer Cultural Center in Palma de Mallorca, Spain. First floor level. House museum. 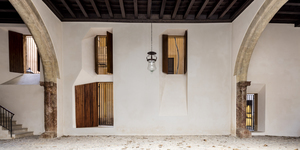 Flores & Prats Architects + Duch-Pizá. 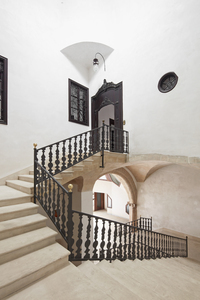 Casal Balaguer Cultural Center in Palma de Mallorca, Spain. 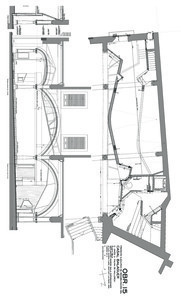 Second floor level. Library and reading rooms. 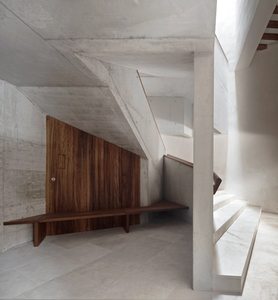 Flores & Prats Architects + Duch-Pizá. 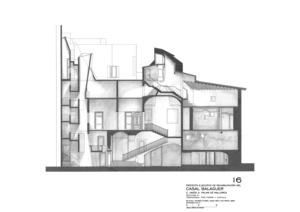 Casal Balaguer Cultural Center in Palma de Mallorca, Spain. 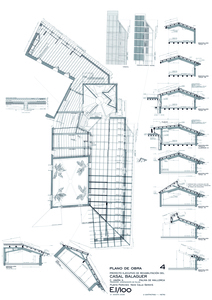 Plan of new wooden roof and series of section of trusses. 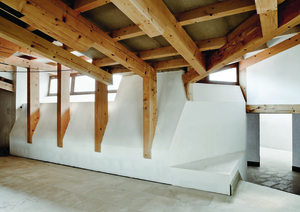 Flores & Prats Architects + Duch-Pizá. 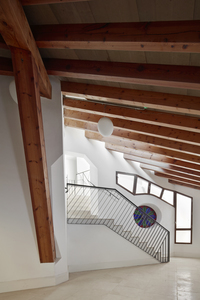 Casal Balaguer Cultural Center in Palma de Mallorca, Spain. Roof level. 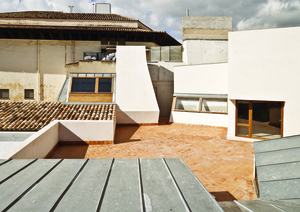 Terrace and lecture room. Flores & Prats Architects + Duch-Pizá. 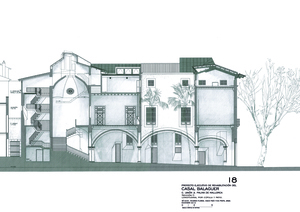 Casal Balaguer Cultural Center in Palma de Mallorca, Spain. 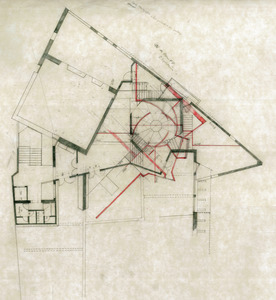 Longitudinal section through entry courtyard, main staircase and dome. 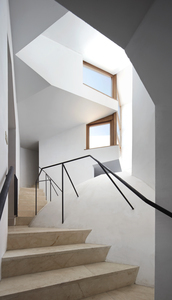 Flores & Prats Architects + Duch-Pizá. Casal Balaguer Cultural Center in Palma de Mallorca, Spain. Photo: Adrià Goula. Flores & Prats Architects + Duch-Pizá. Casal Balaguer Cultural Center in Palma de Mallorca, Spain. 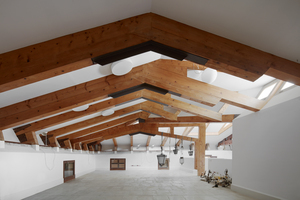 New wooden roof, with entrance of natural light to illuminate the library. Photo: Adrià Goula. Flores & Prats Architects + Duch-Pizá. 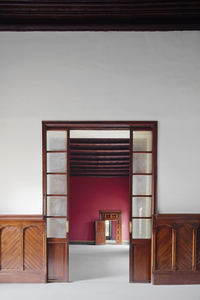 Casal Balaguer Cultural Center in Palma de Mallorca, Spain. 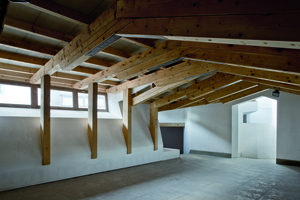 Wooden trusses covering the new library. Photo: Adrià Goula. 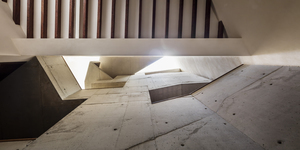 Flores & Prats Architects + Duch-Pizá. 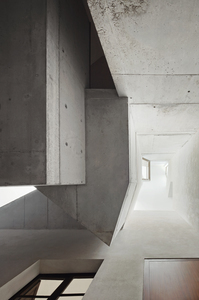 Casal Balaguer Cultural Center in Palma de Mallorca, Spain. Dome above the main staircase seen from the new library. Photo: Adrià Goula. 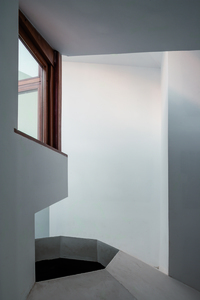 Flores & Prats Architects + Duch-Pizá. 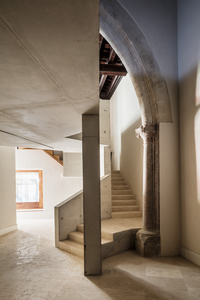 Casal Balaguer Cultural Center in Palma de Mallorca, Spain. Chambers of light and shadow above the dome. Photo: Adrià Goula. 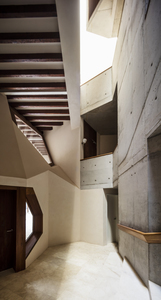 Flores & Prats Architects + Duch-Pizá. 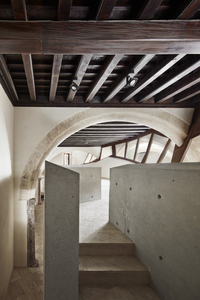 Casal Balaguer Cultural Center in Palma de Mallorca, Spain. Mouth of the dome. Photo: Adrià Goula. 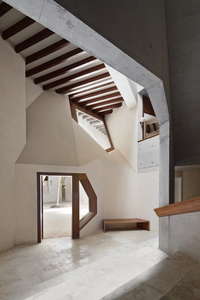 Flores & Prats Architects + Duch-Pizá. Casal Balaguer Cultural Center in Palma de Mallorca, Spain. 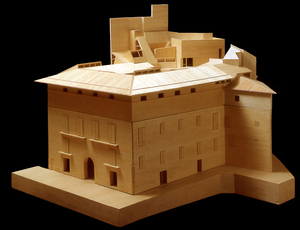 Model of the complete building. Photo: Hisao Suzuki. Flores & Prats Architects + Duch-Pizá. Casal Balaguer Cultural Center in Palma de Mallorca, Spain. 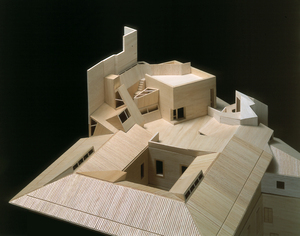 Model of the new roof with skylights. Photo: Hisao Suzuki. Flores & Prats Architects + Duch-Pizá. Casal Balaguer Cultural Center in Palma de Mallorca, Spain. 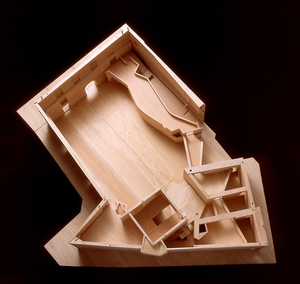 Model of the new roof. Photo: Hisao Suzuki. 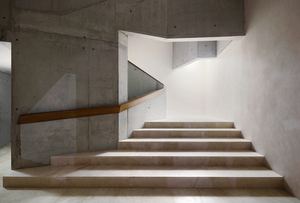 Flores & Prats Architects + Duch-Pizá. Casal Balaguer Cultural Center in Palma de Mallorca, Spain. 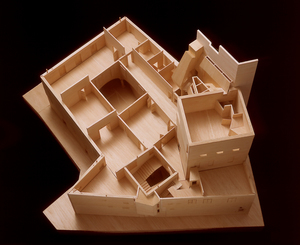 Model of the second floor. 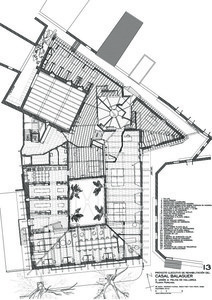 Library and reading rooms under the roof. Photo: Hisao Suzuki. Flores & Prats Architects + Duch-Pizá. Casal Balaguer Cultural Center in Palma de Mallorca, Spain. 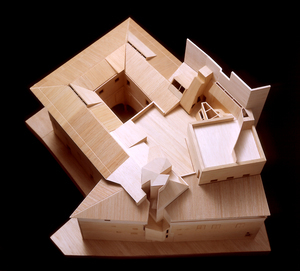 Model of the house museum on the main level. Photo: Hisao Suzuki. Flores & Prats Architects + Duch-Pizá. 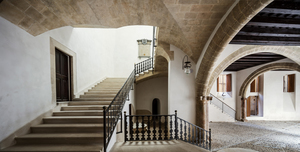 Casal Balaguer Cultural Center in Palma de Mallorca, Spain. 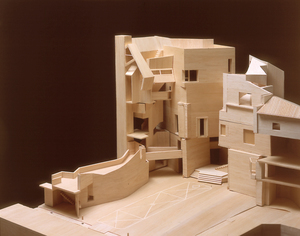 Model of the ground floor street level, with exhibition gallery on two levels. Photo: Hisao Suzuki. Flores & Prats Architects + Duch-Pizá. 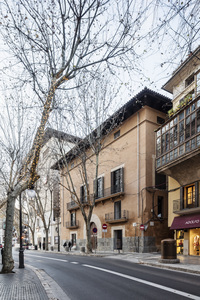 Casal Balaguer Cultural Center in Palma de Mallorca, Spain. 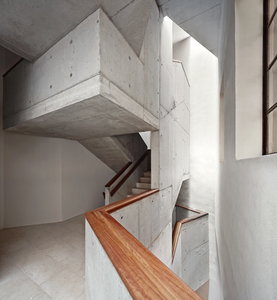 Access with new exhibition gallery and concrete stairs. Photo: Hisao Suzuki. Flores & Prats Architects + Duch-Pizá. 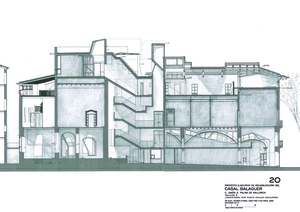 Casal Balaguer Cultural Center in Palma de Mallorca, Spain. 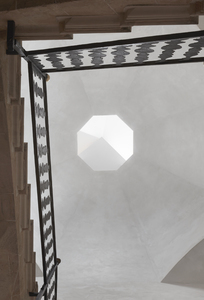 Gallery, new staircase and dome. Photo: Hisao Suzuki. Flores & Prats Architects + Duch-Pizá. 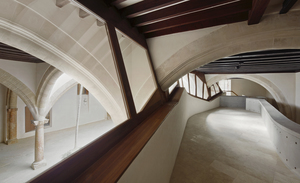 Casal Balaguer Cultural Center in Palma de Mallorca, Spain. 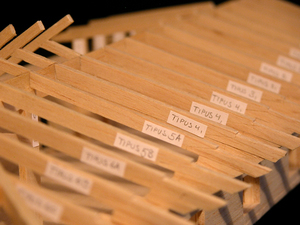 The different types of trusses. Photo: Hisao Suzuki. Flores & Prats Architects + Duch-Pizá. 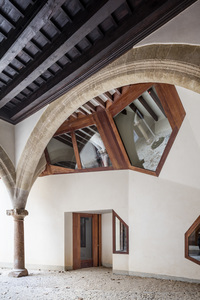 Casal Balaguer Cultural Center in Palma de Mallorca, Spain. 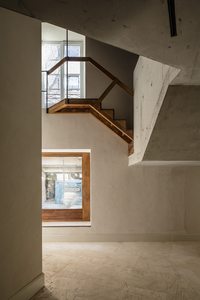 Fragmentary section along the new concrete staircase and elevator. Flores & Prats Architects + Duch-Pizá. 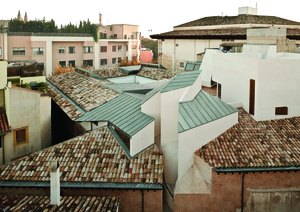 Casal Balaguer Cultural Center in Palma de Mallorca, Spain. 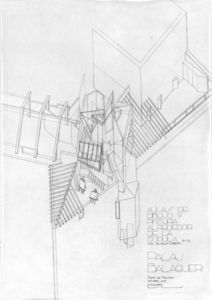 Preparatory drawing of the arrival of the new stairs to the terrace level. Flores & Prats Architects + Duch-Pizá. 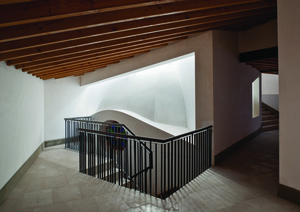 Casal Balaguer Cultural Center in Palma de Mallorca, Spain. 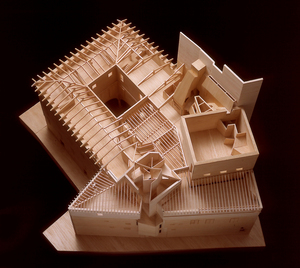 Model of the new wooden structure for the roof. Photo: Hisao Suzuki. Flores & Prats Architects + Duch-Pizá. 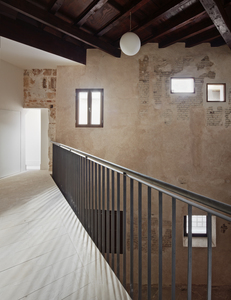 Casal Balaguer Cultural Center in Palma de Mallorca, Spain. 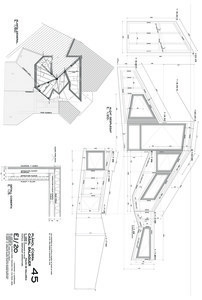 Plan and section of test for skylight above the dome. Flores & Prats Architects + Duch-Pizá. 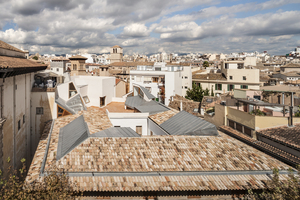 Casal Balaguer Cultural Center in Palma de Mallorca, Spain. 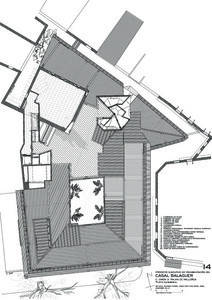 Axonometric view of the new spaces around and above the existing dome. Flores & Prats Architects + Duch-Pizá. 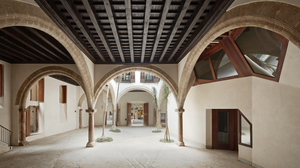 Casal Balaguer Cultural Center in Palma de Mallorca, Spain. 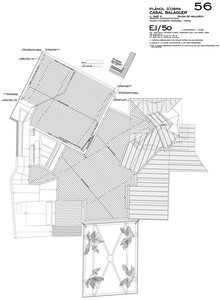 Axonometric view of the new interventions in the palace. Flores & Prats Architects + Duch-Pizá. 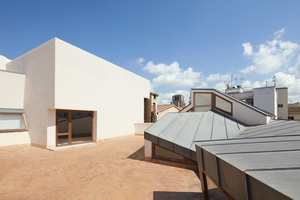 Casal Balaguer Cultural Center in Palma de Mallorca, Spain. 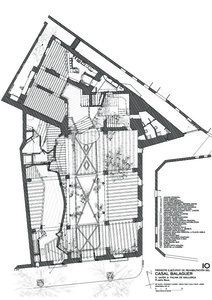 Situation plan of the Cultural Centre in the old town of Palma. Flores & Prats Architects + Duch-Pizá. Casal Balaguer Cultural Center in Palma de Mallorca, Spain. Ground floor level. 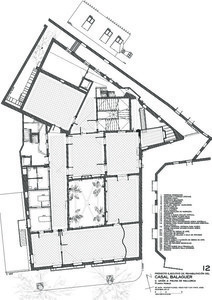 Access through courtyard, exhibition gallery and bar-restaurant. Flores & Prats Architects + Duch-Pizá. 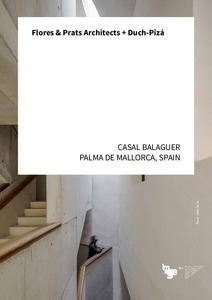 Casal Balaguer Cultural Center in Palma de Mallorca, Spain. Photo: José Hevia. Flores & Prats Architects + Duch-Pizá. Casal Balaguer Cultural Center in Palma de Mallorca, Spain. The entrance at street level. Photo: José Hevia. Flores & Prats Architects + Duch-Pizá. Casal Balaguer Cultural Center in Palma de Mallorca, Spain. Calle Unión. Photo: Adrià Goula. Flores & Prats Architects + Duch-Pizá. Casal Balaguer Cultural Center in Palma de Mallorca, Spain. Exhibitions mezzanine. Photo: Adrià Goula. Flores & Prats Architects + Duch-Pizá. Casal Balaguer Cultural Center in Palma de Mallorca, Spain. Long window at gallery space on the ground floor. Photo: Adrià Goula. Flores & Prats Architects + Duch-Pizá. Casal Balaguer Cultural Center in Palma de Mallorca, Spain. Pavement at roof terrace and tower. Flores & Prats Architects + Duch-Pizá. Casal Balaguer Cultural Center in Palma de Mallorca, Spain. Detail of structure of the roof over the dome. 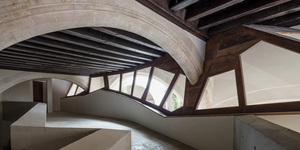 Flores & Prats Architects + Duch-Pizá. 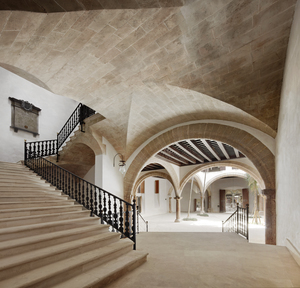 Casal Balaguer Cultural Center in Palma de Mallorca, Spain. Exhibition gallery at ground floor.